Today churches will collect the Mission Illinois Offering, which supports the ministries in this prayer guide and more. It is so important that we reach the $475,000 goal. Consider your own gift for state missions. In worship and prayer today, consider all the things that IBSA churches achieve together. We are grateful for God’s blessing on missions and ministry that reach lost people with the gospel of Jesus Christ. But with a little more than 70,000 people worshiping in Southern Baptist churches in Illinois today, we are far outnumbered. And with at least 8-million lost people in our state, the task before us is monumental—but not insurmountable. God can bring a spiritual awakening to Illinois. And Baptists can stand ready to join in sharing the gospel of Jesus Christ. Faithful prayer and missions support make God’s work strong and growing. Pray for all our partner churches to give today, and for Executive Director Nate Adams and the missions support staff of IBSA. Give to the Offering. If your church promotes and receives a Mission Illinois Offering, we encourage you to give that way. If not, you can also give here — www.IBSA.org/GiveToMIO. alongside other New Awakening Evangelism Conference attenders in Decatur. 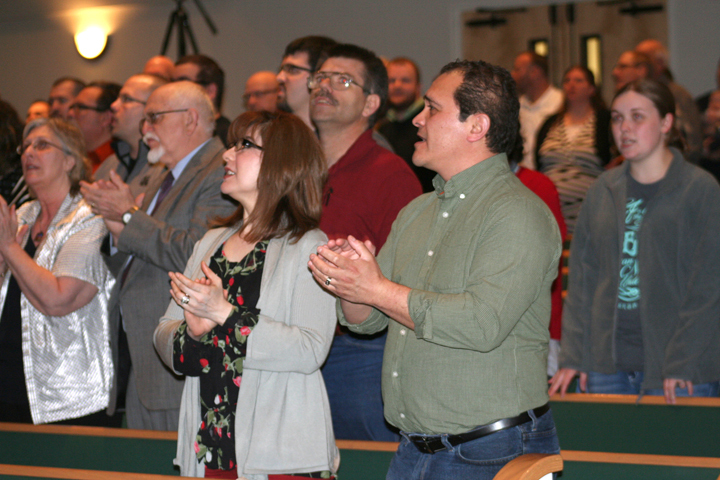 Spiritual revival and awakening—the kind of movement only God can bring—was the focus of IBSA’s New Awakening Evangelism Conference March 27-28 at Tabernacle Baptist Church in Decatur. At a time when baptisms and worship attendance are in decline in many churches, and culture seems to be moving farther from God, the need for awakening is real. A church—the Church—cannot revive itself, speakers emphasized during the conference. But some responsibility for revival does fall on Christians—to prepare for a movement of God, to be desperate for it, and to provide a verbal witness for the hope they have in him. One of the major issues New Awakening speakers addressed is the declining number of young people Southern Baptist churches are reaching with the gospel. In 1972, there were 137,000 youth baptisms in Baptist churches, Reid said in a breakout on next generation ministry. Today, there are 70,000 or fewer per year. We haven’t seen a movement that touched young people since the “Jesus people” movement of the early 1970s, Reid said at the conference. That period of awakening was characterized by the Holy Spirit’s activity in and among churches—he was the main character in revival, just as he was in the Book of Acts. If Christians haven’t seen a movement of God in their lifetimes, will they recognize it when it happens? In other words, when we talk about revival and awakening, what are looking for? It’s pervasive, he added, a turning of the spiritual tide. Undeniable. So why haven’t we seen it? Speakers at the New Awakening Conference outlined two possible reasons: “skill fade” in the area of evangelism, and a lack of desperation for revival. Joel Southerland compared many church members and leaders to pilots who have lost their skills after relying too heavily for too long on autopilot. “Pilots are accustomed to watching things happen and reacting, instead of becoming proactive,” said Southerland, executive director for evangelism strategies at the North American Mission Board. The church has fallen victim to the same phenomenon. “We have put our churches on autopilot” when it comes to evangelism, he said. Dennis Nunn, founder of Every Believer a Witness Ministries, differentiated between the “come and see” evangelism model of the Old Testament, and the “go and tell” model in the New Testament. “I believe we have come to accept what our church members will not do in evangelism because we have accepted the Old Testament approach,” said Nunn. Our witness will become less and less effective, he continued, because we think simply inviting people to church is evangelism. And then there’s the matter of how much we want revival. The reason the Great Commission probably won’t be realized in our lifetime, Pastor Johnny Hunt said during the conference, is because we live for pleasure, not for the Word of God. “Lord, forgive us,” said a conference attender from the Chicago suburbs, in response to Hunt’s words. He continued, referencing Isaiah’s encounter in the temple: “It is not until you see God for who he is that you will see yourself for who you are and others for who they are,” and thus their need for God. God’s people are desperate for revival, Sadler said, when nothing but God will do; when we stop compartmentalizing our lives into church and work and family and hobbies, and let God be God over all of it. “We need God to superintend every aspect of our lives,” he said. “It’s like Ephesians 3, where Paul prays that they would experience the fullness of Christ [and] be filled with his presence, so that it spills over into every aspect of our lives. So that we see our neighborhood differently. Chicago leaders convened a one-day prayer meeting and equipping conference in January at Lighthouse Fellowship Baptist Church in Frankfort. In January, Stilwell led his congregation in a concert of prayer similar to the prayer for spiritual awakening at the IBSA Annual Meeting in November. The Paxton church is one of many in Illinois joining a national call to prayer, including more than 30 in metro Chicago. The call to prayer comes ahead of the 2015 Southern Baptist Convention meeting in Columbus, June 10-11. SBC President Ronnie Floyd picked up past president Fred Luter’s call for revival. “Our greatest need is a mighty awakening in the nation. This has to be preceded with a strong sense of personal revival and church revival,” Floyd said. 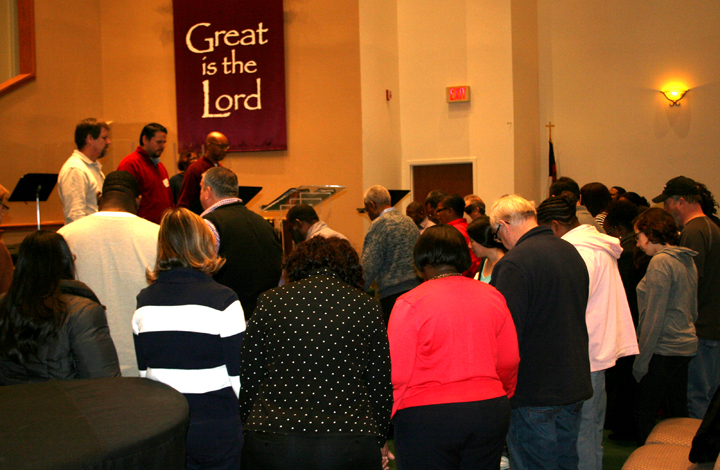 In metro Chicago, more than 75 people gathered at Lighthouse Fellowship Baptist Church in Frankfort for an all-day prayer and equipping conference in late January. The prayer coordinator for Chicago Metro Baptist Association, Cheryl Dorsey, urged attenders to seek God’s direction. My best prayerwalking technique came from second graders. Editor’s note: This is the fourth and final post in a series on prayer and spiritual awakening. Read the previous posts: 2015: The Year of Prayer, Revise us, O Lord, and 15 prayer requests for your city. One of my most profound prayerwalks took place with a pair of 7-year-olds. On that particular Saturday at our church, everyone had already paired up for the half-hour walk through our community of 500 homes. Leaving me with my son, Joseph, and a friend’s grandson, Antoine. On school days, waking Joseph up was an ordeal. But on prayerwalking Saturdays, he beat me at getting up and ready to head to church. Amazing! We use the simple strategy – walking the neighborhoods around our church in two’s and three’s – to identify needs in our community and pray on the spot for people we encounter, that they might come to know Christ. Even though I was towering over my prayerwalking partners, I felt seven inches tall. Each session starts with a 15-minute meeting at the church. This is when we distribute prayer guides, go over prayerwalking basics, and point everyone to a focal Scripture that will set the stage for the next hour. We send pray-ers out from the church in two’s and three’s, instructing them to go as far as they can and be back in half an hour. As they go, we urge them to pray “on site with insight.” That’s God’s insight and not their own. Prayerwalkers pray as they’re prompted by the things they encounter. Every street is different. Our prayers should feel conversational, low-key, but powered from on high. If folks across or down the street can hear us, we’re doing it wrong. Each person in the groups takes a turn praying in short paragraphs, not soliloquies. I like it to making a prayer quilt – everyone brings a piece. If we encounter people along the way, we introduce ourselves and ask if they have any prayer needs. If they say yes, we ask permission to pray for them right there. Or, we take the names and requests back to the church to add to our prayer list for the week. During our walk, we may pray, quote Scripture, or sing, all as the Spirit prompts the pray-ers. Once everyone is back at the church, we take 15-20 minutes to recap the experience. This is very powerful! Prayerwalking teams share what they encountered and how the Lord had them praying, as well as names they’re adding to the prayer list. As the teams report, a scribe records the headlines on a flip chart, chalkboard, or poster. The Lord reveals his awesomeness as our teams often see a theme emerge. Even though they prayed on different streets, they see how God loves the community, and works in us through the Holy Spirit to “pray things out” over our neighbors. The prayerwalkers recognize that God has a plan, that they can hear his voice, and that he can use them to bless his people. That first day I prayerwalked with Joseph and Antoine, I witnessed our youngest pray-ers interceding from their perspective. They prayed for the practical and immediate needs of the house we were passing by, and they hit some spiritual pay dirt. From that point on, they were my favorite prayerwalking partners that summer. I mention them often when I teach, saying kids pray differently because they see things from a different level. They blessed me, and showed me that children have a place in our prayerwalking ministry. You don’t need to pontificate, just walk, see and pray. Cheryl Dorsey is a prayer coordinator and pastor’s wife at Beacon Hill Missionary Baptist Church in Chicago Heights. She also serves as prayer leader for Chicago Metro Baptist Association. This column first appeared in the Spring 2015 issue of Resource magazine, online at http://resource.IBSA.org. Editor’s note: This is the third post in a series on prayer and spiritual awakening. Read “2015: The Year of Prayer,” and “Revise us, O Lord,” at ib2news.org. A mid-1800’s revival that started with a small prayer meeting in New York City resulted in thousands upon thousands of people trusting in Christ. We need such a movement today, perhaps using several ideas from this list. Use personally, or with family devotions. Share it with your church prayer group of Bible study group. Share on Facebook. Lead your church to pray for one item each Sunday for 15 Sundays. Use each one for a church prayer focus for a week each. 1. Invite the Holy Spirit to teach you to pray as He helps you to pray. 2. Pray for your pastor – his spiritual health, his marriage, his family, his vision, wisdom, and spiritual power. Ask God to enhance his ability to lead your church to reach your city or town. 3. Pray for your church family to enthusiastically engage in serving your community. 4. Pray the same for the pastors in your city. 5. Pray for the newest church you know and the oldest church. 6. Pray that your church family will impact your city or town in 2015 as never before. 7. Pray for your mayor – a sense of accountability to God, humble acknowledgement of need for wisdom, relationship to God, and desire for righteousness and integrity. 8. Pray the same for your police chief. 9. Pray the same for your fire chief. 10. Pray the same for your city council or your local elected official. 11. Pray the same for your superintendent of schools. 12. Pray for the schools closest to you, the high school and its principal, the grade school and its principal. 13. Pray for those who work in the healthcare system in your community – administrators, doctors, nurses, technicians. 14. Pray for your closest neighbors or friends to be saved and be fully devoted disciples of Jesus Christ. 15. Pray for a merchant or clerk you interact with on a regular basis. Charles Lyons pastors Armitage Baptist Church in Chicago. Editor’s note: This is the second in a series of posts on prayer and spiritual awakening. Read the first, “2015: The Year of Prayer,” here. Read the headlines in Christianity Today and you’ll being praying for a revival. Read Time magazine and you’ll plead with heaven for a spiritual awakening. From the church, we have reports of plummeting Sunday attendance: Polls once claiming 40% or more are now reporting a more accurate 17%. And the statistics about disappearing youth are even more appalling. And in the culture: States are redefining marriage. Economic collapse is rooted in a corrupt banking system. And for more examples of why we are desperate for a spiritual awakening, we need only to watch the evening news. The Church needs to be revived. Not merely your congregation, but the Church across North America. A revival that spills out of our sanctuaries and brings spiritual awakening to the tributaries that feed and fuel our culture. Education. Business. Media. Family. Health Care. Entertainment. But have we considered this: What if God is responding to our prayers for a revival and our pleas for an awakening, but we are failing to notice? What if God is answering our calls for reviving the Church by His work of revising the Church? Could the revising work of the Holy Spirit be a preparing of the Church for some kind of non-traditional impact on our culture? Should we be looking for new ways the Church is influencing communities with God’s good news? Since the 1980’s leaders have commented on how several trends have brought correction and health to the Church. Worship has become, well, worship. We are learning to sing songs as an expression of praise and petition rather than as performance or for our entertainment. In many congregations, prayer has matured from reciting lists of sick members to listening to the Spirit; from me, myself, and I, to the least, the lonely, and the lost. Church planting has become a top priority in a growing number of evangelical denominations. The churches my daughters take my grandkids to are new and vibrant, unhindered by traditions and systems designed for 19th century cultures. Cities are no longer merely zip codes. God has raised up “city reachers,” leaders with a citywide vision who call the Body of Christ in a community or city to serve better together in collaborative evangelism. The “100 Cities Invitation” hopes to catalyze acts of kindness and justice to demonstrate the Good News in 100 cities in 2016. That same year, RESET, a new initiative led by under-35 leaders, will call young people to the National Mall in Washington, D.C. for repentance and revival. Could spiritual awakening of their generation be far behind? In all this, I see God answering our pleas for revival by revising the Church in a Romans 12:2 way. Our methodologies are being transformed by the Holy Spirit’s renewing of our minds. We are rethinking the need to reconnect evangelism and discipleship. Even very small congregations realize they need to get our of their seats and into the streets with the prayer-care-share lifestyle of Christ-followers. We read more and more of a new generation of leaders who bring good news in very different ways that relate to our radically changed culture. I see signs that God is responding to our “revive us again” supplication and the seeds He is planting for spiritual awakening. What signs do you see? Phil Miglioratti heads the National Pastors’ Prayer Network and serves as IBSA’s prayer ministries consultant. This column first appeared in the Spring 2015 issue of Resource magazine, online at http://resource.IBSA.org.